Daily chart of Scorpio Bulkers Inc. (SALT), $7.55. Trade: We recommend selling 10 Jun $5 naked puts (143 DTE) for a net credit of $500 or better (closed at $.45 x .50, but the daily is extended short-term so should get filled at higher prices on a pull back). Note: Although we typically prefer selling shorter-term options (days to weeks) to get paid for theta (time) decay, this still provides over 1.5% ROI/month on margin with the strike price being 34% away! 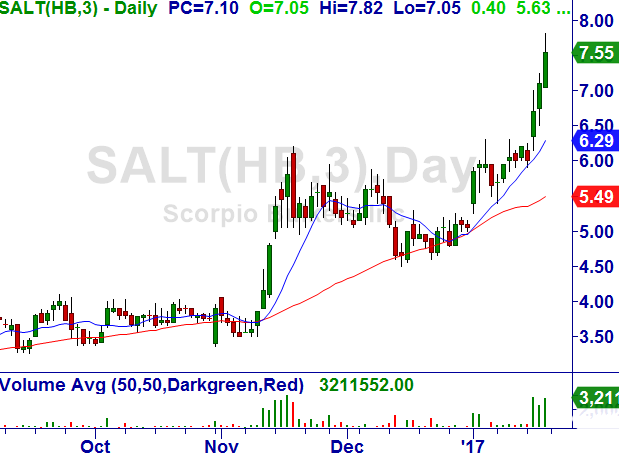 Strategy: After a robust breakout in the stock and sector last November, SALT retraced, consolidated, and broke out last Friday. The volume (money) into the stock and sector are increasing with bullish weekly and monthly charts. Max Gain: $500 credit received. Max Loss: Cost basis is $4.50/share if assigned (34% cushion), but will be less with stop posted.